The wooden steps which used to provide access to the cave (as seen in Dave Crocker's 2008 photo Link ) were removed as unsafe and at the time of my visit the old sandstone steps were fenced off to discourage their use. In the 16th century, Nesscliffe Hill was a hang-out for highwaymen who would hold up travellers on the Shrewsbury to Oswestry road. One of these men was "Wild Humphrey" Kynaston who was outlawed for his part in the murder of a man at Little Stretton. He is said to have lived in a cave in Nesscliffe Hill, robbing from the rich and helping the poor. They say he had an impressive horse, capable of leaping over men, gates and on one occasion a gaping hole in the bridge over the Severn at Montford. Kynaston was pardoned in 1516 and died in 1534. The cave was lived in until at least the 18th century when a family of nine was raised in what must have been very primitive conditions. Nowadays it is a home for bats which breed and hibernate in deep crevices in the rocks. Three species have been observed here: Pipistrelle, Daubenton's and Natterer's. Information condensed from the nearby County Council info board. Nesscliffe Hill is a large red sandstone outcrop on the Shropshire Plain. The western side of the outcrop has been quarried and the stone used in many local buildings. 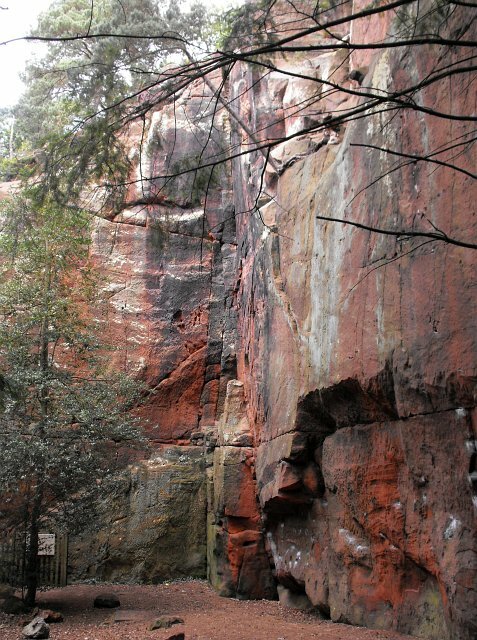 This area is popular with rock climbers. The ramparts of an Iron Age hillfort can be found on the northern part of the hill. Cut into the quarried face is a man-made cave, reputedly the home of 'Wild' Humphrey Kynaston, a highwayman who lived from 1474-1534. The cave is known to have been occupied by a family of nine in the 18th century. The Earls of Bradford who once owned the hill built tea pavilions on the top and held dances and archery contests there. The sixth Earl was a keen forester and planted exotic species such as Californian redwoods and rhododendrons on the hill. Nesscliffe Hill is access land and is a part of Nesscliffe Hill Country Park which has three distinct areas - The Cliffe, Hopton Hill and Nesscliffe Hill. This page has been viewed about 155 times.